It has become an obsession. 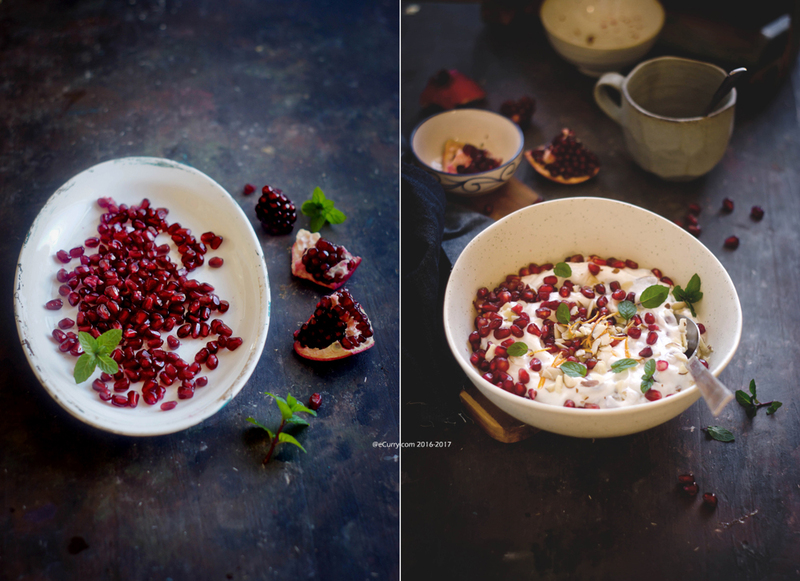 Pomegranate obsession and we need to disengage ourselves from it. Pomegranates are getting scarce now. Raita in Indian subcontinent is a side dish made with yogurt, vegetables (or fruits) and some spices/herbs added to it. The consistency of the dish varies from one place to another. There are no fixed rules to what can be added to the yogurt. It acts a dish by itself or a side dish and are at their best during the summer heat or to cool down a fiery Indian dish. The fruity raitas usually do not have the slight hint of heat that the other raitas could have. They are chilled and soothing, more like a dessert or breakfast bowl but it all depends on who makes it and who is eating it! I went to the store early morning on the Christmas eve to look for pomegranates. The lines were long. But they moved fast – everyone cheerful, glowing and in preparation for Christmas. I love this time of the year. Red bows and cardinals, shimmering lights and Christmas music…So I picked up the box of pomegranates, Greek yogurt and a few other things that quickly slid down the belt. I slipped my credit card back into my wallet and hollered a cheerful “Merry Christmas” as I was moving away with my cart. The man at the counter turned around and he wished me back followed by an enormous smile. The little things that can make your day. Twenty years and more… I still encounter the question out of sweet curiosity if we celebrate Christmas. “Yes I do”, I say. I have a Christmas tree with neatly wrapped presents underneath. My daughter starts playing Christmas music on the piano long before December says hello. We bake cookies for Santa, spy on the Elf on the shelf and I could not miss service in the church on Christmas eve. “OH” some say, maybe a bit apologetically… “I did not know that Indians celebrate Christmas…“. Every time I have this conversation, I tug on to that thread of nostalgia and walk back home. To the city which has fragments of British rule everywhere. A city where the streets, homes, hearts and bricks have assimilated and imbibed the English culture in such a way that it is our own now. Now that we are in a different country, there have been many faces and voices where I see the question, and that hesitation. The place which wrapped me with so much diversity, so much unity that we never thought to think otherwise. Back in our childhood, we weaved ourselves through a mesh, a beautiful mesh quilted with different colors and shapes. Some abstract, some overlapped. But it did not matter. We are not white. The first difference. I do understand the hesitation…There is that careful voice playing inside telling them not to offend, not to overstep. Mostly out of respect. But it makes me go deep and think about things I never did back then. I grew up with different religions as a part of me. We waited with fluttering hearts for Santa Claus to hand out presents in the church premises (there was no sleigh. he came in a rickshaw!) and found happiness in lighting up the home with diyas on the dark night of Kali Puja. We fasted all morning to do Aarti on Ashtami and said the Lords Prayer every single day in school, with equal reverence. I revered the rows of softly glowing candles in Bandel Church and the intoxicating Dhunuchi Naach of the Durga Puja with identical intensity. I grew up in a Hindu family. I went to a Catholic missionary school. I kneeled down to pray in the school chapel, patches of light streaming in through the stained glass windows, my bare knees cold on the polished floor, the navy blue uniform skirt covering my black mary janes, hand clasped under my head resting on the old brown pews with the smell of polish seeping into me. In the evening I sat down on the red concrete floors with my folded hands, saying prayers to our family God, the swirling smoke of the incense stick rising up to the heavens in front of me. Same prayer, same day, same me. The walk down Park Street during the cold December nights with my cousins, holding hands under the banners and curtains of twinkling lights, the music and festivities to usher the Yuletide, held the same wonder and excitement as hopping Puja pandals with friends during Durga Puja. Christmas would not be complete without the sticky brown Plum Cake from Flury’s, the tearoom in Park Street. I love it so much that I have my dad bring it for me on every visit. No Durga Puja would be rounded off without the scrumptious Bhog either. I could list a hundred more comparisons. Back then I never thought to analogize. It was a way of life. We had Christmas tree at home that sat adjacent to a Hindu God. Bible was stacked with Gita. Churches were attended as many times as temples. I found as much peace in the tranquility of St. Paul’s Cathedral, (with its awe inspiring architecture reaching up to the sky) as I found it in the dark, cool corner of our neighborhood Rash Mandir, Thakurbari. Christmas carols in the middle of the night was as much awaited as was the sound of Dhaak at four in the morning of Mahalaya. Listening to them in half sleep, dream like state is something I would love to do again and again. There was pure balance. The fragrant bhuna khichuri of the Puja held the same delicious significance for me as the Chicken curry and Misti Pulao for Christmas lunch did. The diversity coexisted within me. It could be the environment I grew up in, the ease with which everything was accepted or it could be a child’s mind. Every winter time, my heart skips out once in a while and strolls the streets back home to seek that harmony. Pomegranates mark the beginning of fall and winter. I wait to see the sparkling smile of my girls when they get back from school and I point to the big pile of these jeweled red in the basket. 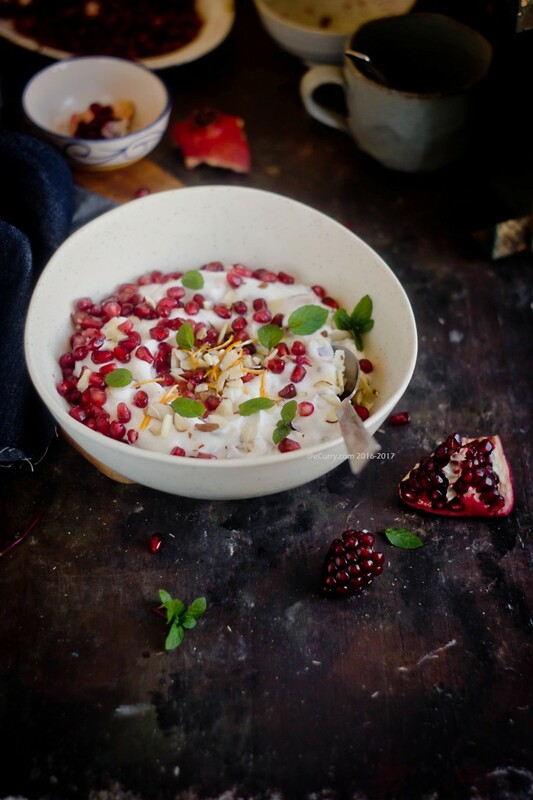 This cooling, soothing raita has become a part such an involved part of our meals that we are anticipating it with fear the time when pomegranates are found no more. They have slowed down. Since October of last year, there have not been a day when we did not eat a pomegranate. We were going through ten pomegranates or more a week! When I bought a dozen pomegranates and went back again the next week for more, the associates in the store asked me what we have been doing with them, or how we have been eating them. “Ask my kids”, I said. 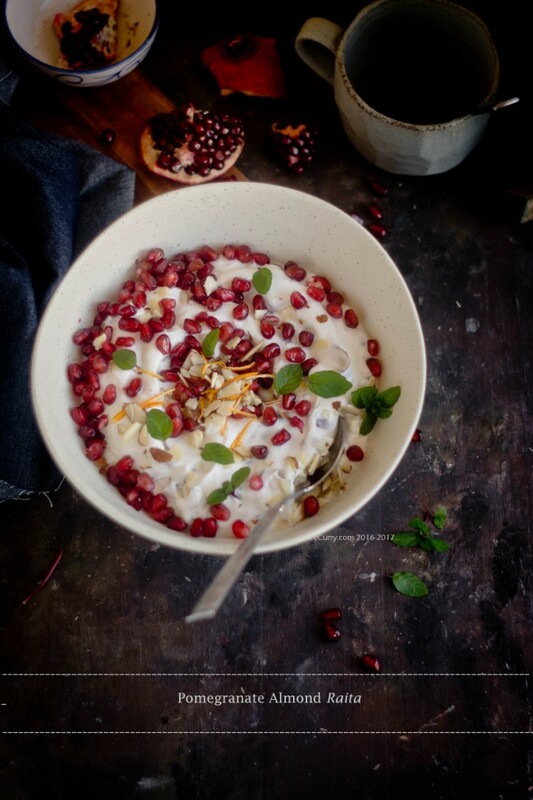 Breakfast, snack and every meal, pomegranate has been the story of our life. This recipe is a no recipe dish. It is for yours to make. 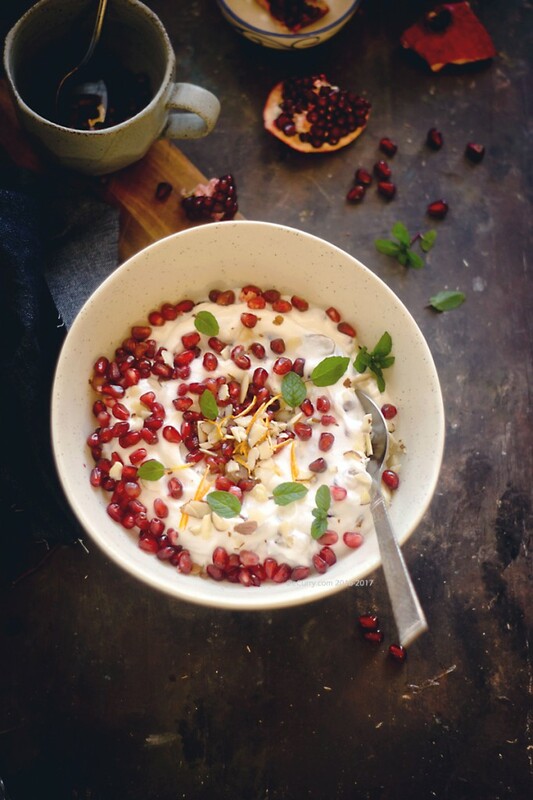 The crunchy aril pair extremely well with the creamy yogurt. We love the orange zest, almonds and mint it it. But tastes vary. So do it your way. This is just an idea for you and a record to keep on my part. As we move through this life, meandering through changes, I try to make that place at home for my children where there is that coexistence and acceptance of all. It is not just that stream of nostalgia…it is more about embracing it all with a heartful of love. If you are not using Greek yogurt, strain out the yogurt until its thick and creamy. 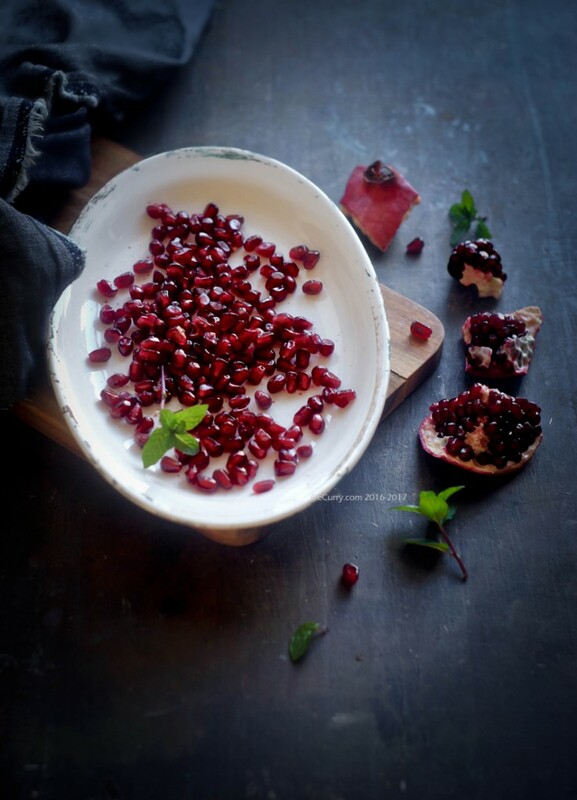 Remove arils from pomegranates and set aside. Muddle sugar with mint leaves. If you are not using sugar, julienne the mint leaves or crush them. Whisk yogurt and orange zest or extract, until creamy and lump free. Fold in the sugar and mint. Fold in the pomegranate arils and the almonds. 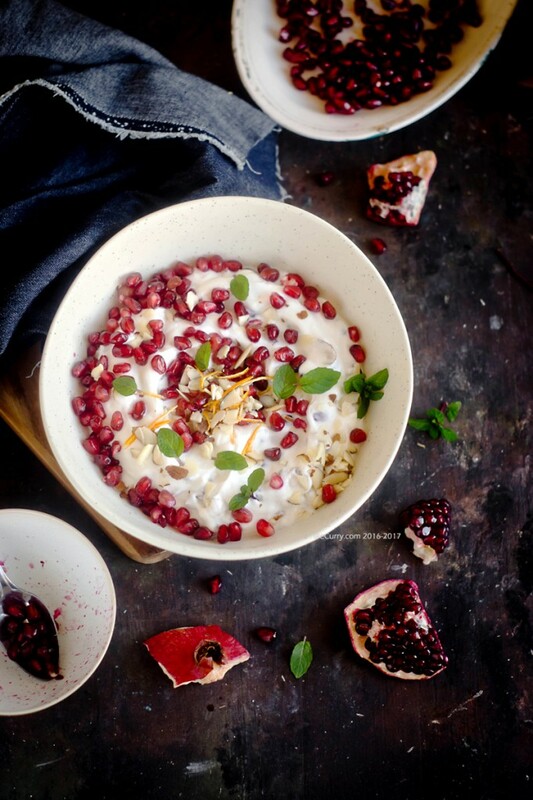 Garnish with more pomegranate arils and fresh mint. Chill until ready to serve. This is a very free form recipe. 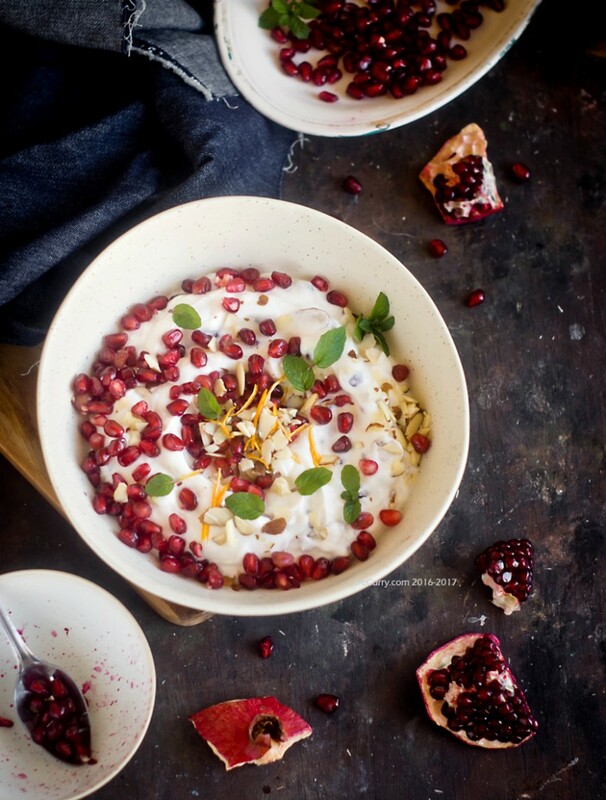 Use any any amount of yogurt to any amount of pomegranates. Serve as a side dish, a condiment, healthy snack or a dessert. the usual Raita uses a slight sprinkle of roasted cumin powder which I have not used here. January 26th, 2016 | Category: Condiments, Dips & Sauces, Indian Sweets, Sides & etc. Mesmerizing recipe. Just Love it. Fo you have a recipe book published? Thanks so much for the recipe! I’m making it as a healthy snack for the week. 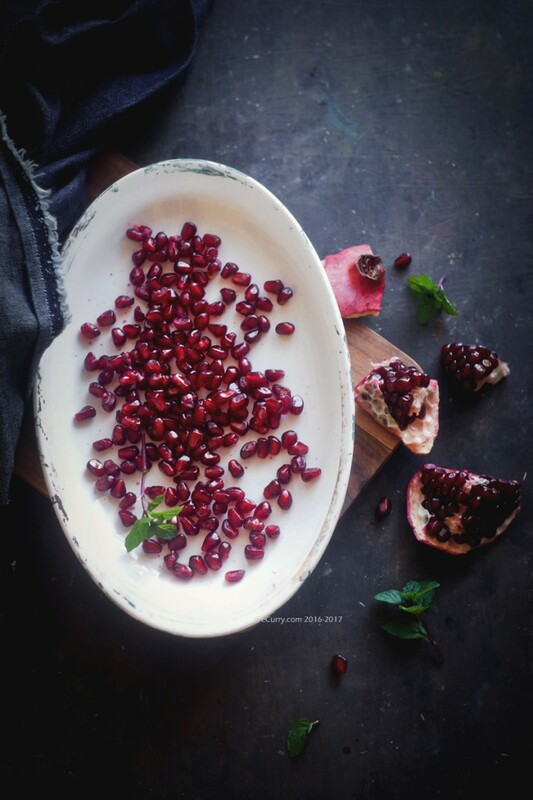 I just love pomegranate and this looks delicious. Love it! Your blog is amazing!